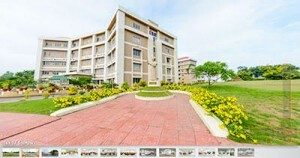 Albertian Institute of Science and Technology (AISAT) – Technical campus, Kalamassery, is an undertaking of Archdiocese of Verapoly-an Archdiocese which has a track record of centuries serving in the field of education. This great legacy of the Archdiocese today is maintained and fostered under the benevolent patronage of His Grace Most. Rev. Dr. Joseph Kalathiparambil, the Metropolitan Archbishop of Verapoly. AISAT is located in the industrial belt of Cochin City, neighbored by Cochin University of Science and Technology, nestled by the side of National Highway 47 and Seaport – Airport road. AISAT is easily accessible. AISAT was blessed by His Grace Dr. Francis Kallarakal, the Metropolitan Archbishop of Verapoly on August 31, 2011 for which the foundation stone was laid on July 22, 2010. The college affiliated to M.G. University, Kottayam and APJ Abdul Kalam Technological University, Thiruvananthapuram, offers B.Tech courses in Civil Engineering, Computer Science & Engineering, Electrical & Electronics Engineering, Electronics & Communication Engineering and Mechanical Engineering. Also offers M.Tech in Civil Engineering (Geomechanics and Structures).